William the Silent (Dutch: Willem de Zwijger) also known as William of Orange and William I, Prince of Orange (Dutch: Willem van Oranje) (1533–1584), was the leader of the Dutch Revolt as first stadholder of the Netherlands (1572–84). The stadholder was the hereditary chief executive and commander in chief of the United Provinces of the Netherlands. In the Netherlands, he is celebrated as the vader des vaderlands or father of the fatherland. William was Count of Nassau and Prince of Orange; the eldest son of William, Count of Nassau-Dillenburg, he was born at Dillenburg in Nassau on April 24, 1533. 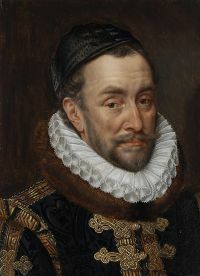 In 1544 he succeeded his cousin Réné as Prince of Orange, an inheritance which gave him large estates in the Netherlands. Educated as a Catholic under the direction of the Emperor Charles V, he early gave proof of his political gifts. When in 1555 King Philip II of Spain succeeded Charles V as sovereign of the Netherlands, William doubted the wisdom of his policy; though still himself a Roman Catholic, he opposed the persecution of Protestants. In 1559 he learned by accident details of Philip's further intentions but cautiously withheld comment, thus earning his nickname of "the Silent." He held aloof from the abortive uprising of 1566–1567; but when Philip sent the ruthless Duke of Alva to put down the revolt, William withdrew to Germany, raised forces, and invaded the Netherlands. His attempt failed and for the next three years he organized the resistance movement known as les Gueux, "the Beggars." Some of these, the Sea Beggars, got together a fleet and seized Brill in 1572. William again invaded the Netherlands, and in response to his leadership the northern provinces of Holland, Friesland, and Zeeland rose against Alva. William intended to restore the freedom of the Netherlands and end the religious persecution. But the revolt became associated with the Calvinist religion which was strong in the northern provinces and which he himself adopted. Catholicism was still dominant in the south, and this, combined with a clash of economic interests, created a cleavage between north and south. Although he organized the struggle against Spain (1577–1583) chiefly from Brussels and Antwerp, his plan for a united Netherlands ultimately broke down and he had to retire to the north where his authority as stadholder of the Netherlands (the northern provinces) was paramount. In 1580 Philip II set a price on his head and William responded by issuing his famous "Apology", declaring his unalterable devotion to the cause of the Netherlands. His popularity waned, and his political strength was at a low point when on July 10, 1584, he was shot and killed by an assassin at his house in Delft. He had, however, already laid the foundation of Dutch independence, and it was finally secured by his sons, Maurice of Nassau (1568–1625) and Frederick Henry (1584–1648). The magnetism of his personality and his gift of leadership made him charismatic. A competent rather than a brilliant soldier, he was outstanding as organizer, diplomat, and statesman, and showed a moderation and humanity unusual in his age. He fully deserved the title "Father of the Fatherland" bestowed on him by his people. Among his services to the Dutch nation were his use of the Dutch language for official purposes and his foundation of the University of Leiden in 1575. ↑ Several other rulers were also known as "William of Orange." "Orange" refers to a medieval title, not to any country. This page was last modified on 9 April 2019, at 19:38. This page has been accessed 3,521 times.